Since Saturday morning, TSA Madagscar lead veterinarian Dr. Ny Aina Tiana Rakotoarisoa and keepers Avimasy, José, and Tsito have been on the ground performing health assessments and providing medical and husbandry care for the more than 7,000 Radiated Tortoises (Astrochelys radiata) seized from wildlife traffickers in a remote village in southwestern Madagascar. With support from local volunteers, and the government’s Ministry of Environment, Ecology, and Forests (MEEF), the team has worked tirelessly under hot, dry conditions to provide the tortoises with the best care possible under the circumstances. TSA Madagascar veterinarian Dr. Rakotoarisoa inspects the health of a tortoise. Water, food, shade, and veterinary assistance are critical at this time. To combat the effects of stress, dehydration, and starvation, the team has set about building large temporary enclosures, separating tortoises by size, retrieving water from distant sources, and purchasing bulk quantities of food from the nearest villages. Fittingly, to provide the tortoises with larger accommodations, the team has used reclaimed wood from crates used by the smugglers for the tortoises’ transport—building temporary enclosure walls into the adjacent spiny forest. This action will significantly help reduce crowding stress and allow the tortoises more choices from which to find refuge. Assistants use the wood from transportation crates utilized by the wildlife traffickers to build temporary walls into the surrounding habitat. While Dr. Rakotoarisoa reports that overall, the condition of the tortoises is better than that of the 10,000 confiscated this past April, they are light in weight, dehydrated, weak, and in need of critical intervention. Despite the team’s greatest efforts, another 85 tortoises were found to have succumbed to their ailments in the past 48-hours, illustrating the devastation wrought by wildlife trafficking. 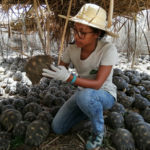 TSA Madagascar staff member Tsito performs a daily life-check for the more than 7,000 tortoises now under our care in a remote Malagasy village. Meanwhile, the TSA and our partners SOPTOM and the Directeur Regional de l’Environment, de ‘Ecologie et des Forets (DREEF) are currently strategizing a plan for the recovery effort and long-term care of these tortoises. Our current goal is to start transporting the tortoises to better accomodations at our newly improved Lavavolo Tortoise Center near Itampolo and SOPTOM’s Village des Tortues in Mangily as soon as possible. We will continue to provide updates on this developing crisis as they are available. Until then, please consider DONATING TODAY. With over 18,000 Radiated Tortoises currently under our care in Madagascar, the addition of thousands more will significantly increase the burden of financial and resource support. Radiated Tortoises of various ages and sizes struggle to find room in the rudimentary holding pens constructed by wildlife traffickers. For more information please contact Jordan Gray, Communications and Outreach Coordinator at jgray@turtlesurvival.org.